A tribunal is about to rule on China's territorial claims in the disputed South China Sea. But Beijing's desire for control is about much more than rocks above the water, argues analyst Alexander Neill. It is also central to China's plans for a submarine nuclear force able to break out into the Pacific Ocean. Historically, China's national infrastructure projects have tended to be of grandiose scale - the Great Wall of China and the Three Gorges Dam are ancient and modern examples. China has now proved such a capability at sea with the imminent opening of a string of advanced military bases across the South China Sea, where just two years ago little more than rocky outcrops, sandbars and reefs dotted the region. International attention has focused on why Beijing's constructed these artificial islands so speedily. There is speculation that with the imminent announcement of the ruling by the Permanent Court of Arbitration in The Hague on the Philippines' territorial dispute with China, Beijing fast-tracked the project to create a fait accompli or a "great wall of sand". For China, national sovereignty and the credibility of the Communist Party is at stake. But so too is its new sea-based nuclear deterrent. The island construction serves a dual purpose, both reinforcing China's claims of sovereignty and creating a sustained Chinese presence, both military and civilian, in the South China Sea. China has argued that in addition to necessary defence measures for its islands they will also serve the public good. China has built lighthouses and a hospital on Fiery Cross Island and it is likely that Chinese government administrative departments will be created on the islands too. But a critical element to China's motivations for island-building lies beneath the surface of the sea. 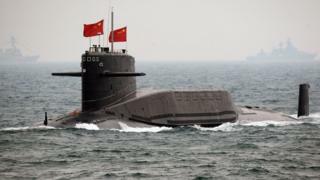 Mounting concern within the People's Liberation Army's (PLA) over the vulnerability of its land-based nuclear deterrent and the ability to deliver a retaliatory second strike has prompted China to place some of its nuclear warheads on board submarines. Two years ago, China deployed the Jin-class ballistic missile submarine for the first time, each armed with 12 JL-2 nuclear missiles. Operating from a state-of-the-art base near Sanya, on Hainan island's southernmost tip, Jin class submarines are now patrolling the depths of the South China Sea. But in order to be within range of the US, they must be able to break out into the Pacific Ocean. Before the submarines achieve this, they must leave their base in Hainan and cross the South China Sea to reach the Pacific Ocean undetected. The Pentagon believes that the first such Pacific patrol will occur this year. A large southern area of the South China Sea is rather shallow - under 100m (328 feet) in depth. However, roughly contiguous to China's "nine-dash line" territorial claim in the South China Sea, the continental shelf drops to a deep basin of around 4,000m, offering better cover for submarines. That is why some experts believe the deeper waters of the South China Sea, and China's enhanced anti-submarine efforts there, may offer a bastion for Chinese submarines in the future. In recent years, the depths of the South China Sea have become a theatre for intensified rivalry between China and the US. In early 2009, Chinese fishing vessels attempted to cut the cables attached to a sonar array towed by the US surveillance vessel USNS Impeccable in waters off Hainan Island. Later that year, a Chinese submarine hit an underwater sonar array being towed by the destroyer USS John McCain near Subic Bay off the coast of the Philippines. Recently, China has launched new submarine-hunting capabilities. On 8 June, The PLA Navy commissioned a new Type 056A frigate, the Qujing, which boasts an array of anti-submarine warfare capabilities and will be based in the South China Sea. The US Secretary of Defence Ashton Carter has also announced that the Pentagon will invest $8bn (£5.45bn) to ensure the lethality of its submarine force - the "silent service" - including the deployment of new undersea drones in the region. In the same way as the US and its allies created a network of listening devices on the sea floor across Asia to listen out for Russian submarines during the cold war, China is now in position to deploy a similar network from its bases across the South China Sea. Satellite imagery suggests that China's new islands are bristling with advanced sensors including radar arrays and satellite communications stations, all of which bolster its navy's situational awareness above and below the South China Sea. Such technologies may also provide command and control infrastructure for communications with China's ballistic missile submarine force, not only helping it to evade detection but also to target any adversary. Alexander Neill is Shangri-La Dialogue Senior Fellow at IISS-Asia (International Institute for Strategic Studies - Asia) .